A two time Mid-American Conference choice for the Central Michigan Chippewas, Hopkins caught 26 receptions for 326 yards in 1989. 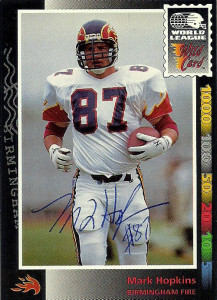 Hopkins was signed in 1990 as a free agent by the Atlanta Falcons but did not make the squad. Gailey‘s ball control offense. 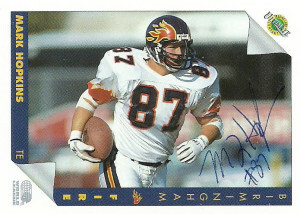 In 1991 Mark caught 6 passes for 86 yards. He returned to the team again in 1992, and followed up with 11 more receptions for 94 yards. Equally adept at blocking as well as catching the ball, Hopkins frequently would bookend with fellow TE Phil Ross and the combined duo provided a safety valve for quarterbacks Brent Pease, Eric Jones, and Mike Norseth. The league reorganized after the 1992 season. I enclosed a few cards in the envelope for Mark to keep after searching high and low to find out where he was at. He wrote me a nice letter and thanked me for bringing back some great memories. Mark also told me about how he was shocked the first time he saw his own card and how it brought him a great deal of joy, and his kids now that they are old enough to see them. Mark has been working in the human resources industry for quite a while now and is the Executive Vice President of Wealth Management Services at WorkLife Financial.